College (or school of any kind) is mostly about transferring knowledge from one person to another. By reading a chemistry book or a football rule book, you can learn/gain knowledge about how something is supposed to work. But just because you have knowledge about “how” it works, doesn’t mean you can “make” it work. Making it work is about “doing it,” about “learning from doing it” and “learning from failing at doing it” – this is what I call failing forward. Failing forward is the only degree you can get at the School of Hard Knocks, which is what makes it different from other schools. Failing forward is about taking action and applying knowledge (i.e., knowledge in action). It’s about Simeon Rice getting knocked down, experiencing what it is like NOT to have his feet in position under his body, getting up and doing it over and over again until he gets it right. It’s about failing to make a startup profitable or starting over several times until you make it work. Thomas Edison articulated the concept of failing forward brilliantly when he said, “I have not failed. I’ve just found 10,000 ways that won’t work.” Have you ever failed forward? Like a child falling off a two-wheeler as he tries to learn to ride a bike, have you ever been unsuccessful multiple times before you finally found the success you were looking for? The School of Hard Knocks is unique to each individual. In other words, only “you” can experience failure and only “you” can learn from it. If you never allow yourself to fail, you never allow yourself to learn. If you allow yourself to fail, but choose not to learn, you will replicate the failure. Neither scenario moves you forward. As a coach, my job is to jump start the learning process for those enrolled in the School of Hard Knocks. Specifically, I help to facilitate your learning from past failures by helping you to activate (by doing) so you learn (from what you are doing) and activate (by doing) again. In the end, it is about learning what worked and what didn’t work. The process continues until you achieve success. 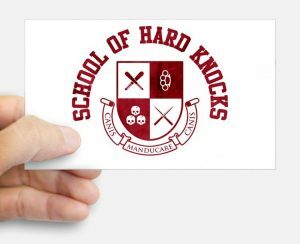 I have often wondered why I’ve never heard anyone speak to specific fields of study or associated degrees offered at the School of Hard Knocks. As mentioned above, it’s because there is only one field of study, only one degree – a degree in failing forward, which is awarded only to those who persevere until they find success. Just like Thomas Edison, the inventor of the light bulb, or Simeon Rice and the Tampa Bay Buccaneers, the winners of Super Bowl XXXVII, have done. Can you imagine all that is possible for you if you graduated with a failing forward degree from the School of Hard Knocks?